BL Banking is the eBanking program for all corporate clients. Thanks to the newly added database interface, the EBICS software is perfectly equipped for large amounts of data. Besides this, the current version also has a lot more new features. When many and large files pile up in payment transactions, systems with file-based storage soon reach their limits. Users must then have a lot of patience while working, because then these systems often respond very sluggish or even cancel operations with an error. Programs with database however, leverage all of their strengths in such situations. For example searching an account statement for a certain intended purpose succeeds in a very short time, even if the system has stored many thousand statements. With the current version, a database interface is now the backbone of the EBICS software. Thus, the application is extremely efficient even on normal PCs. The import of all existing data into the database is performed during the automatic program update without further involvement of the user. The major database systems from Oracle, Microsoft and MySQL are supported. If one of these systems is available in the enterprise, it can immediately be used with BL Banking. For the setup, the program has a separate page in the update wizard. 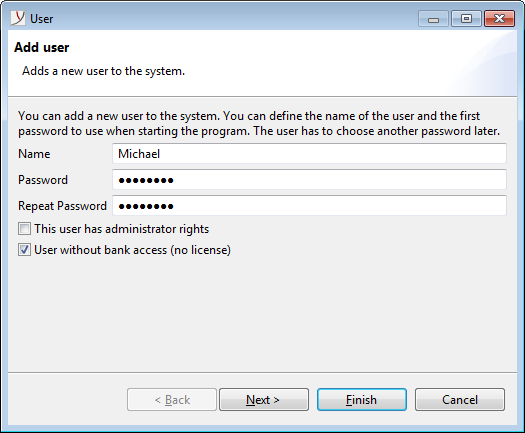 At this point, the parameters for user, password and the access URL to the database can be entered easily. If there is no database available in the company, the H2 database contained in the update from BL Banking can be used immediately without further user interaction. Even this database embedded in the program, provides a significant performance boost when processing large files and amounts of data. 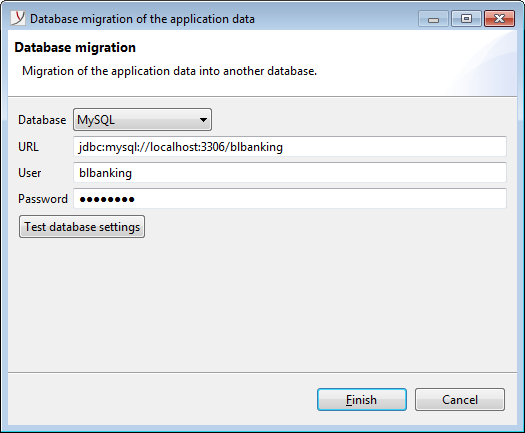 The software also supports a later change to a different database system. Switching can be done at any time easily via a separate menu item in the preferences. Another big improvement is the possibility to create program users, who do not have their own EBICS access. After approval by the administrator, these so-called local users can, for example, record payments or view account statements. No additional software licenses are required for the local users configured in the user administration. The filter options in the account statement have been enhanced with the current version and allow easier handling when there is a large number of accounts. In the account overview, the filters can easily be filled with search terms. In addition, the period of time, for which account statements are to be displayed, can now be set. Both functions make for a very tidy account overview. In the view of open payments, it is now possible to create folders. Using the folders, payments can be grouped, resulting in significantly better clarity, in particular if there are a large number of payments. Via the new context menu item Properties, details of a sent file can be displayed. The view shows the signature information, which previously could only be extracted from the customer protocol. Similar to the dialog for signing an order, you can navigate through the payment details here. Automatic exports for account statements and transactions can now be adjusted, so that the export is carried out for certain accounts only. 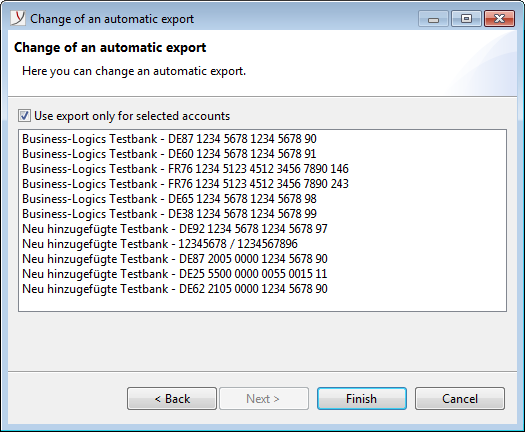 The selection of the accounts can be done conveniently using the setup wizard for automatic exports. In addition to the XML format, AWV report files can now be created in CSV format. 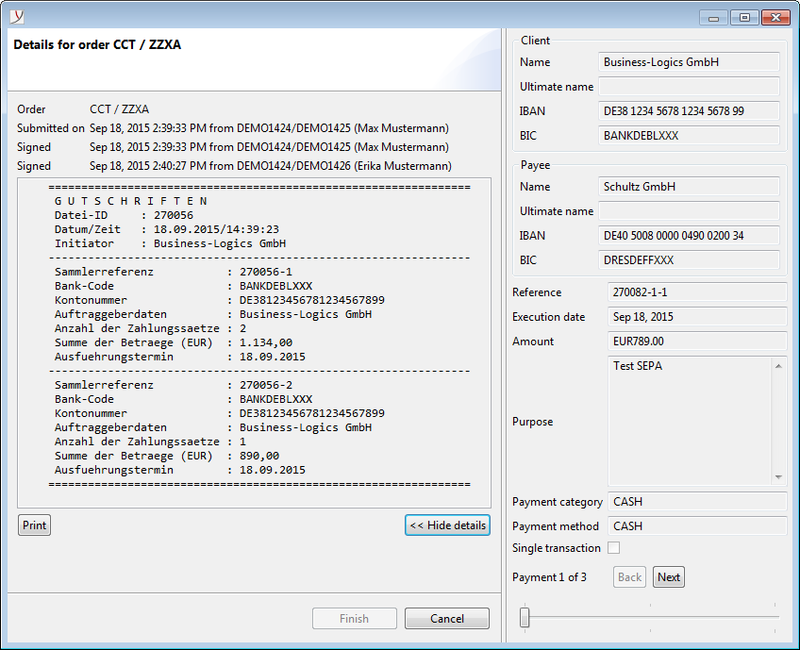 While entering SEPA payments, BICs are checked for validity against the SCL directory of the German Bundesbank.